It wasn’t her first visit to my practice. This sweet 84-year-old woman had previously been referred to me for another root canal. This time, she was experiencing pain on the lower left side of her mouth. She was struggling with cold sensitivity and some pain when biting. She was referred for tooth #18. Her periapical x-rays showed recurrent decay under her crown #18, but that wasn’t the whole story. Her bitewing showed that she had some recurrent decay under another crown, on tooth #14. I wanted to be thorough in my exam, so I took an additional periapical radiograph of tooth #14. 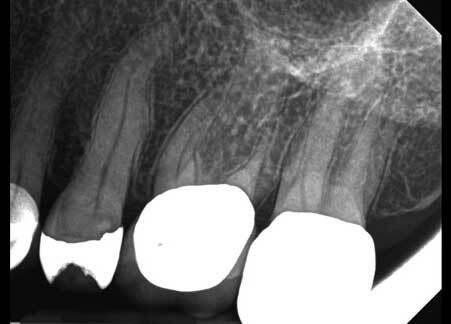 This x-ray showed no obvious periapical pathology, but allowed me to see that there was more than one problem. After running through my diagnostic tests, I was able to diagnose tooth #18 with Symptomatic Irreversible Pulpitis and Symptomatic Apical Periodontitis. Tooth #18 had lingering pain to cold and was tender to percussion. The process reinforced a lesson I’ve learned again and again: It’s important to take a bitewing in your workup of a patient to make sure you make the correct diagnosis. Something like this could potentially bite you in the a**! Appropriate treatment plans require observing and listening. My job is saving teeth when possible, so now that I had diagnoses, I needed to evaluate whether the teeth could be restored. In order to know, in this patient’s case, I was going to have to remove the crowns, excavate the teeth, and then reassess the teeth for restorability and possibly even crown lengthening. With the mystery of the diagnosis solved, there was more to address – not only how viable the teeth were, but why my referral slip from her general dentist was basically empty. I had no information to go by. It was important I know what she had discussed with her general dentist. I always like to know the patient’s treatment plan. So I sat down and began asking questions, listening, and observing. I saw her hands trembling as we spoke, so I started to wonder how good her manual dexterity was – and how that might be impacting her oral hygiene. I also noticed she seemed very confused and needed me to repeat myself several times. So I asked her, “Did you come with anyone today?” She told me she’d come with her husband. I offered to invite him in so he could understand what’s going on. It was then that she informed me that her husband was suffering from dementia – and she too had been diagnosed with the onset of Parkinson’s. She was losing the ability to care for her teeth, and recovery time for so many potential procedures was going to be significant. I hadn’t asked about her personal or financial situation, but I knew it was possible that she was the sole caretaker of her husband and that they could already be bearing significant medical costs. Taking all this into consideration, I wanted to present to her all of her treatment options. This sweet patient really needed my time, and I needed to make sure that she understood everything. So I laid it all out for her. She could extract the teeth (and do nothing else). She could extract the teeth and replace the teeth with implants or bridges. She could try to save the teeth and do the root canals with some buildups. She could try to save the teeth and do the root canals with crowns and possible crown lengthening. We could excavate and see what’s left, and then make a decision. Throughout the process, I was open and honest with her. I told her my concerns about whether or not she could keep the area clean to prevent this from happening again. I also told her what it would take—in terms of cost and recovery—for each option. As we continued talking, I continued learning more and more about her. She was always told not to extract her teeth. She was nervous about dental procedures and wanted to be sedated, something that I don’t offer other than valium. What’s best for patients is determined on a case-by-case basis. In the end, she elected not to schedule treatment with me. I wanted her to understand what it was going to take to make all of that happen and then let her make her own decision. She wouldn’t have been in a position to make an empowered decision about her own dental health if I hadn’t taken the time to talk to her. Talk to your patients. Observe them. Listen to them. Understand their unique situation and give them all their options. Keep explaining until you feel confident that they understand everything, even if that means you have to repeat yourself. 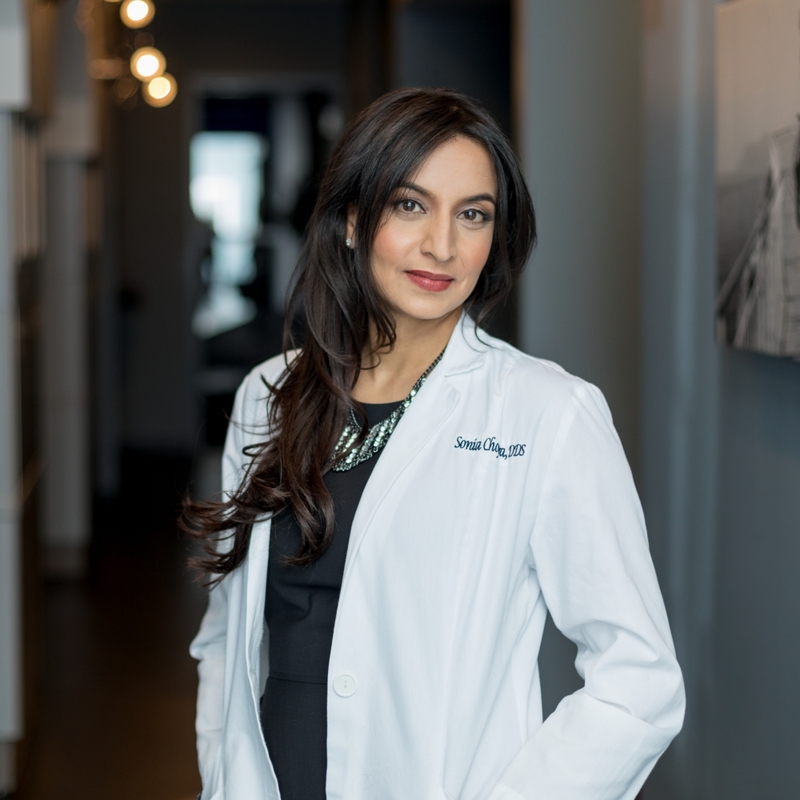 Minimize the number of referrals, when possible, so your patients end up in the right hands for what’s best for them as soon as possible – and they can put their hard-earned money towards the appropriate treatment. Give them the information, time, and patience they deserve, and their gratitude will be immense. Never underestimate the importance of bitewing x-rays in diagnosing patients. It’s key to observe your patients and truly listen to them to determine a treatment option that is right for them. Present patients with their options (and what each option means in terms of recovery time and financial impact) to enable them to make empowered choices about their own dental health. Thanks JM! Let me know if there are any topics that you think I should cover for general dentists. Great story…very easy to talk and not listen. I always tell my patients I am here to educate them about making an informed decision that works for them. Thank you for sharing Dr. Sonia. Would she not have discomfort from the pain in 18 with no treatment, and if she lives another 10 years, that may potentially cause decay in other teeth. Would extraction of those teeth and electric tooth brush use have been a better approach?? I recommended extraction of #14 and #18 for this patient. I have seen her manual dexterity decline significantly over only a few months. So, that was my recommendation. Unfortunately, this will likely happen to other teeth in her mouth. Everything you described here Sonia “should” ethically be requisite Dentistry procedures for all Practitioners. Love all you do to help elevate the Dentistry profession!